I was lucky enough to have the winning bid on this ARC for a fundraiser, and was so happy that it was annotated! 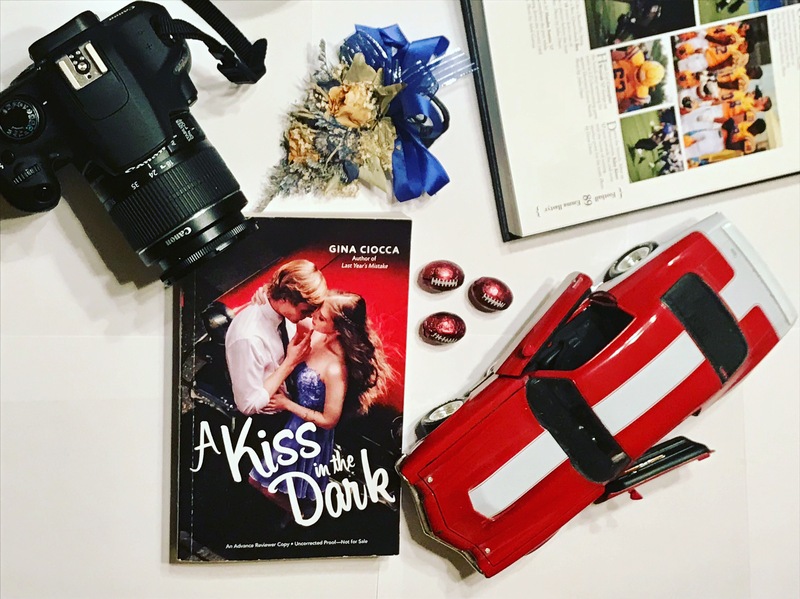 ‘A Kiss in the Dark’ was released earlier this month by Simon Pulse. The premise of this book immediately drew me in, and I’ve been desperately waiting to read this book for months. It’s told in dual timelines, just like her debut, ‘Last Year’s Mistake‘, with one timeline taking place in her junior year of high school, and the other during her senior year. I guessed who had kissed her in the dark about halfway through the book, but I wasn’t totally sure. There’s a plot twist towards the end of the book that I can’t talk about, obviously, so I don’t spoil it, but I was shook. Shook in a good way, obviously. I definitely got all the feels. Ugh. SO CUTE. Do yourself a favor and read this book so you know what I’m talking about, because as much as I want to fangirl about it, I won’t spoil it for you all! Anyway, I really loved Macy as a main character. She actually reminded me a lot of Marisa, the protagonist of Gina’s novel ‘Busted’, since she loves photography too. Since I got to read the little notes that Gina annotated on the margins, it was cool to see what changed from the ARC to the finished copy, like how she edited the scenes with the kiss to make it more explicitly consensual, and that in the finished copy she has the characters address it more directly. All of the characters had secrets, and at first I thought that Macy’s friendship with Meredith was really toxic, but by the end their relationship had been flushed out enough to address that as well. I really liked the characters of Jadie and Tyrell, Macy’s best friend and her boyfriend. I also liked how her relationships with Noah and Joel played out, because they felt realistic and definitely not forced, which is the same way I felt about her and Ben. It was interesting to see how a year can change so much in the dynamics of her relationship with all three of them, and of course it made me desperate to know what had changed to create such tension between them all. Overall, I really liked this book, and would definitely recommend it to anyone who loves contemporary YA, and to readers who are fans of Gina’s previous books. You can follow Gina on Twitter at @gmc511 and on Instagram at @gmciocca! This sounds so cute! I love the dual timelines aspect of how the story is told! I’ll be adding this one to my TBR list! Lovely review!